A car valet centre next to a railway line in Sussex has been destroyed by fire. 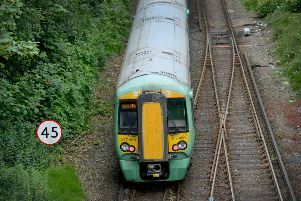 West Sussex Fire and Rescue Service was called to Bognor Road, Chichester at 8.40pm yesterday evening following reports of a fire next to the railway line. It is the third fire in recent days, following a tip fire and a fire in Chichester city centre. Two fire engines from Bognor and Chichester were sent to the fire, which was confirmed to be a car valet centre '100 per cent involved in the fire', a single-storey building of 10m by 30m, according to a fire service spokesman. The road was cordoned off when it was suspected that there could be gas cylinders at the site - but it was eventually established that there were none there. Hose reels, jets and breathing apparatus were used to put the fire out. Fire crews left the scene at just before 11.30pm, the spokesman said. Today, investigators will be inspecting the scene to find out the cause of the fire and whether or not it was deliberate.